^ a b c d Room 2006, p. 230. 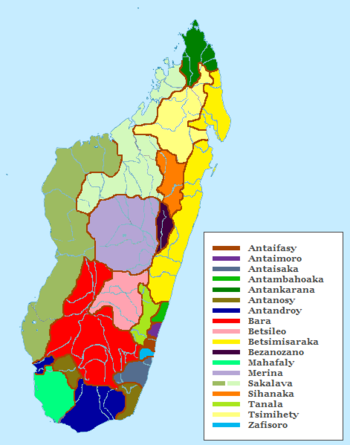 ^ a b c “Madagascar as a model region of species diversification”. Trends in Ecology and Evolution 24 (8): 456–465. (June 2009). doi:10.1016/j.tree.2009.03.011. PMID 19500874. オリジナルの2012年2月11日時点によるアーカイブ。. https://www.webcitation.org/65N9YtmnD?url=http://www.mvences.de/p/p1/Vences_A163.pdf 2012年2月11日閲覧。. ^ Tattersall, Ian (2006). Origin of the Malagasy Strepshirhine Primates. Springer. pp. 1–6. ISBN 0-387-34585-X. https://books.google.com/books?id=nsBtrhsMU5EC&pg=PA3. ^ a b Callmander, Martin; et. al (2011). “The endemic and non-endemic vascular flora of Madagascar updated”. Plant Ecology and Evolution 144 (2): 121–125. doi:10.5091/plecevo.2011.513. オリジナルの2012年2月11日時点によるアーカイブ。. https://www.webcitation.org/65NBBr5AX?url=http://www.mobot.org/MOBOT/Research/curators/pdf/PLECEVO_2011.pdf 2012年2月11日閲覧。. ^ Lavranos, John (2004). “Pachypodium makayense: A New Species From Madagascar”. Cactus and Succulent Journal 76 (2): 85–88. ^ “Biogeography and floral evolution of baobabs (Adansonia, Bombacaceae) as inferred from multiple data sets”. Systematic Biology 47 (2): 181–207. (1998). doi:10.1080/106351598260879. PMID 12064226. ^ Foster, Steven (December 2010). “From Herbs to Medicines: The Madagascar Periwinkle's Impact on Childhood Leukemia: A Serendipitous Discovery for Treatment”. Alternative and Complementary Therapies 16 (6): 347–350. doi:10.1089/act.2010.16609. ^ Mittermeier, R.A.; Wallis, J.; Rylands, A.B. et al., eds (2009) (PDF). Primates in Peril: The World's 25 Most Endangered Primates 2008–2010. Illustrated by S.D. Nash. IUCN/SSC Primate Specialist Group, International Primatological Society, and Conservation International. pp. 1–92. http://www.primate-sg.org/storage/PDF/Primates.in.Peril.2008-2010.pdf. ^ Mittermeier, R.; Ganzhorn, J.; Konstant, W.; Glander, K.; Tattersall, I.; Groves, C.; Rylands, A.; Hapke, A.; Ratsimbazafy, J.; Mayor, M.; Louis, E.; Rumpler, Y.; Schwitzer, C.; Rasoloarison, R. (December 2008). “Lemur diversity in Madagascar”. International Journal of Primatology 29 (6): 1607–1656. doi:10.1007/s10764-008-9317-y. ^ Jungers, W.L. ; Godfrey, L.R. ; Simons, E.L.; Chatrath, P.S. (1997). “Phalangeal curvature and positional behavior in extinct sloth lemurs (Primates, Palaeopropithecidae)”. Proceedings of the National Academy of Sciences USA 94 (22): 11998–2001. Bibcode 1997PNAS...9411998J. doi:10.1073/pnas.94.22.11998. PMC 23681. PMID 11038588. https://www.ncbi.nlm.nih.gov/pmc/articles/PMC23681/. ^ a b “Mitogenomic perspectives into iguanid phylogeny and biogeography: Gondwanan vicariance for the origin of Madagascan oplurines”. Gene 441 (1–2): 28–35. (2009). doi:10.1016/j.gene.2008.06.011. PMID 18598742. ^ Glaw, F.; Köhler, J. R.; Townsend, T. M.; Vences, M. (2012). Salamin, Nicolas. ed. “Rivaling the World's Smallest Reptiles: Discovery of Miniaturized and Microendemic New Species of Leaf Chameleons (Brookesia) from Northern Madagascar”. PLoS ONE 7 (2): e31314. doi:10.1371/journal.pone.0031314. PMC 3279364. PMID 22348069. https://www.ncbi.nlm.nih.gov/pmc/articles/PMC3279364/. ^ World Wildlife Fund (2001). "Madagascar subhumid forests". WildWorld Ecoregion Profile. National Geographic Society. Archived from the original on 2010-03-08. Retrieved 30 April 2006. ^ a b c d Gade, Daniel W. (1996). 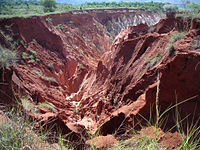 “Deforestation and its effects in Highland Madagascar”. Mountain Research and Development 16 (2): 101–116. doi:10.2307/3674005. JSTOR 3674005. ^ Campbell, Gwyn (1993). “The Structure of Trade in Madagascar, 1750–1810”. The International Journal of African Historical Studies 26 (1): 111–148. doi:10.2307/219188. ^ Virah-Sawmy, M.; Willis, K. J.; Gillson, L. (2010). “Evidence for drought and forest declines during the recent megafaunal extinctions in Madagascar”. Journal of Biogeography 37 (3): 506–519. doi:10.1111/j.1365-2699.2009.02203.x. ^ a b c Campbell, Gwyn (1993). “The Structure of Trade in Madagascar, 1750–1810”. The International Journal of African Historical Studies 26 (1): 111. doi:10.2307/219188. ^ Harper, Grady J.; Steininger, Marc; Tucker, Compton; Juhn, Daniel; Hawkins, Frank (2007). “Fifty years of deforestation and forest fragmentation in Madagascar”. Environmental Conservation (Cambridge Journals) 34 (4): 325–333. doi:10.1017/S0376892907004262. ^ “Deforestation history of the eastern rainforests of Madagascar from satellite images”. Science 248 (4952): 212–215. (1990). Bibcode 1990Sci...248..212G. doi:10.1126/science.248.4952.212. PMID 17740137. ^ Crowley, B.E. (2010). “A refined chronology of prehistoric Madagascar and the demise of the megafauna”. Quaternary Science Reviews 29 (19–20): 2591–2603. Bibcode 2010QSRv...29.2591C. doi:10.1016/j.quascirev.2010.06.030. ^ Dewar, Robert E.; Wright, Henry T. (1993). “The Culture History of Madagascar”. Journal of World Prehistory 7 (4). https://deepblue.lib.umich.edu/bitstream/handle/2027.42/45256/10963_2004_Article_BF00997802.pdf 2016年9月17日閲覧。. ^ Gommery, D.; Ramanivosoa, B.; Faure, M.; Guérin, C.; Kerloc'h, P.; Sénégas, F.; Randrianantenaina, H. (2011). “Oldest evidence of human activities in Madagascar on subfossil hippopotamus bones from Anjohibe (Mahajanga Province)”. Comptes Rendus Palevol 10 (4): 271–278. doi:10.1016/j.crpv.2011.01.006. ^ Dewar, R. E.; Radimilahy, C.; Wright, H. T.; Jacobs, Z.; Kelly, G. O.; Berna, F. (2013). “Stone tools and foraging in northern Madagascar challenge Holocene extinction models”. Proceedings of the National Academy of Sciences of the United States of America 110 (31): 12583–12588. doi:10.1073/pnas.1306100110. ^ a b Hurles, M; Sykes, B; Jobling, M; Forster, P (2005). “The Dual Origin of the Malagasy in Island Southeast Asia and East Africa: Evidence from Maternal and Paternal Lineages”. The American Journal of Human Genetics 76 (5): 894–901. doi:10.1086/430051. PMC 1199379. PMID 15793703. http://linkinghub.elsevier.com/retrieve/pii/S0002-9297(07)60736-8. ^ Campbell, Gwyn (October 1991). “The state and pre-colonial demographic history: the case of nineteenth century Madagascar”. Journal of African History 23 (3): 415–445. ^ a b c Marcus, Richard (August 2004). Political change in Madagascar: populist democracy or neopatrimonialism by another name?. Institute for Security Studies. オリジナルの7 September 2004時点によるアーカイブ。. https://web.archive.org/web/20040907223329/http://www.iss.org.za/pubs/papers/89/Paper89.htm 2012年2月15日閲覧。. ^ Christie, Iain; Crompton, Elizabeth (November 2003). Republic of Madagascar: Tourism Sector Study. Africa Region Working Paper No. 63. Antananarivo: World Bank. オリジナルの2012年1月28日時点によるアーカイブ。. https://www.webcitation.org/651T9jMDr?url=http://www.worldbank.org/afr/wps/wp63.pdf 2012年1月28日閲覧。. ^ Bradt (2011), p. 2. ^ Ranaivoson, Samuel (1980) (フランス語). La formation du personnel enseignant de l'éducation de base à Madagascar: Une etude de cas. Quelques reflections intéressant la programmation de l'assistance de l'UNICEF. Paris: UNESCO. オリジナルの2011年7月10日時点によるアーカイブ。. https://www.webcitation.org/604ferPRD?url=http://unesdoc.unesco.org/images/0004/000404/040436Fb.pdf 2011年7月10日閲覧。. ^ Mukonoweshuro, E.G. (1990). “State "resilience" and chronic political instability in Madagascar”. Canadian Journal of African Studies 24 (3): 376–398. doi:10.2307/485627. JSTOR 485627. ^ a b c Lassibille, Gerard; Tan, Jee-Peng; Jesse, Cornelia; Nguyen, Trang Van (6 August 2010). “Managing for results in primary education in Madagascar: Evaluating the impact of selected workflow interventions”. The World Bank Economic Review (Oxford University Press) 24 (2): 303–329. doi:10.1093/wber/lhq009. オリジナルの2012年2月11日時点によるアーカイブ。. 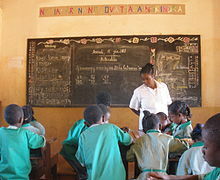 https://www.webcitation.org/65MknBr6d?url=http://www.povertyactionlab.org/publication/managing-results-primary-education-madagascar-evaluating-impact-selected-workflow-interventions 2012年2月10日閲覧。. ^ Ministère de l'Education Secondaire et l'Education de Base (2005) (フランス語). Curriculum de formation des élèves-maîtres. Antananarivo, Madagascar: Government Printing Office. ^ Hurles ME, Sykes BC, Jobling MA, Forster P; Sykes; Jobling; Forster (2005). “The dual origin of the Malagasy in Island Southeast Asia and East Africa: evidence from maternal and paternal lineages”. American Journal of Human Genetics 76 (5): 894–901. doi:10.1086/430051. PMC 1199379. PMID 15793703. オリジナルの2011年3月20日時点によるアーカイブ。. https://www.webcitation.org/5xKUHogZj?url=http://www.sanger.ac.uk/about/press/2005/050504.html 2011年4月30日閲覧。. ^ Tofanelli S, Bertoncini S, Castrì L, Luiselli D, Calafell F, Donati G, Paoli G.; Bertoncini; Castrì; Luiselli; Calafell; Donati; Paoli (2009). “On the origins and admixture of Malagasy: new evidence from high-resolution analyses of paternal and maternal lineages”. Molecular Biology and Evolution 26 (9): 2109–2124. doi:10.1093/molbev/msp120. PMID 19535740. ^ Blench, Roger (1982). “Evidence for the Indonesian origins of certain elements of African culture”. African Music 6 (2): 81–93. JSTOR 30249759. ^ Kus, Susan; Raharijaona, Victor (2000). “House to Palace, Village to State: Scaling up Architecture and Ideology”. American Anthropologist, New Series 1 (102): 98–113. doi:10.1525/aa.2000.102.1.98. ^ a b c Ratsimbazafy 2010, pp. 14-18. ^ 2011 FIBA Africa Championship, FIBA.com, Retrieved 26 October 2015. ^ 2009 FIBA Africa Championship for Women, FIBA.com, Retrieved 26 October 2015. ^ 2014 FIBA Africa Under-18 Championship, FIBA.com, Retrieved 26 October 2015. ^ 2013 FIBA Africa Under-16 Championship, FIBA.com, Retrieved 26 October 2015. ^ 2015 FIBA Africa Under-16 Championship for Women, FIBA.com, Retrieved 26 October 2015. Acquier, Jean-Louis (1997) (フランス語). 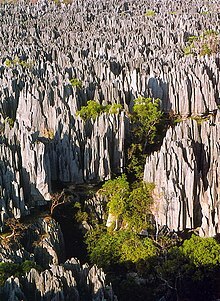 Architectures de Madagascar. Berlin: Berger-Levrault. ISBN 978-2-7003-1169-3. Ade Ajayi, Jacob Festus (1989). General history of Africa: Africa in the nineteenth century until the 1880s. Paris: UNESCO. ISBN 978-0-520-03917-9. https://books.google.com/books?id=sMpMuJalFKoC&printsec=frontcover. Adelaar, Alexander (2006). “Austronesian diaspora and the ethnogeneses of people in Indonesian archipelago”. In Simanjuntak, Truman. Austronesian diaspora and the ethnogeneses of people in Indonesian archipelago. Jakarta, Indonesia: LIPI Press. ISBN 978-979-26-2436-6. https://books.google.com/books?id=Szvr5hUtD5kC&printsec=frontcover. Ames, Glenn Joseph (2003). Distant lands and diverse cultures: the French experience in Asia, 1600–1700. New York: Greenwood Publishing Group. ISBN 978-0-313-30864-2. Auzias, Dominique; Labourdette, Jean-Paul (2008) (フランス語). 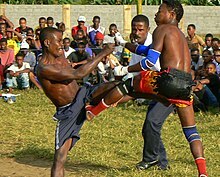 Petit Futé: Madagascar 2008. Paris: Petit Futé. ISBN 978-2-7469-1982-2. Barendse, R.J. (2002). The Arabian seas: the Indian Ocean world of the seventeenth century. Berlin: M.E. Sharpe. ISBN 978-0-7656-0729-4. https://books.google.com/books?id=_qvq9dN8j5MC&printsec=frontcover. Bradt, Hilary (2011). Madagascar, 10th Ed. : The Bradt Travel Guide. London: Bradt Travel Guides. ISBN 978-1-84162-341-2. https://books.google.com/books?id=uTRPnMlOcwgC&printsec=frontcover. Browning, Christopher R. (2004). The Origins of the Final Solution. Jerusalem: Martyrs' and Heroes' Remembrance Authority. ISBN 3-540-63293-X. https://books.google.com/books?id=jHQdRHNdK44C&printsec=frontcover. Campbell, Gwyn (2005). An economic history of Imperial Madagascar, 1750–1895: the rise and fall of an island empire. London: Cambridge University Press. ISBN 0-521-83935-1. https://books.google.com/books?id=13Yt9jLuKzsC&printsec=frontcover. Chapus, G.S. ; Mondain, G. (1953) (フランス語). Un homme d'etat malgache: Rainilaiarivony. Paris: Editions Diloutremer. Cousins, William Edward (1895). Madagascar of to-day: A sketch of the island, with chapters on its past history and present prospects. London: The Religious Tract Society. https://books.google.com/?id=gvREAAAAIAAJ&printsec=frontcover. Curtin, Philip D. (1998). Disease and empire: the health of European troops in the conquest of Africa. Cambridge, MA: Cambridge University Press. ISBN 978-0-521-59835-4. Davies, S.J.J.F. (2003). “Grzimek's Animal Life Encyclopedia”. In Hutchins, Michael. Grzimek's Animal Life Encyclopedia. 8 (2 ed.). Farmington Hills, MI: Gale Group. ISBN 0-7876-5784-0. Deschamps, Hubert Jules (1965) (フランス語). Histoire de Madagascar. Ann Arbor, MI: Berger-Levrault. Ellis, William (1859). Three visits to Madagascar during ... 1853-1854-1856. London: Oxford University. https://books.google.com/?id=nPoGAAAAQAAJ&printsec=frontcover. Emoff, Ron (2004). “Spitting into the wind: Multi-edged environmentalism in Malagasy song”. In Dawe, Kevin. Island Musics. New York: Berg. ISBN 978-1-85973-703-3. https://books.google.com/?id=owU3-pCIvyYC&printsec=frontcover. Fage, J.D. ; Flint, J.E. ; Oliver, R.A. (1986). The Cambridge History of Africa: From c. 1790 to c. 1870. London: Cambridge University Press. ISBN 0-521-20413-5. https://books.google.com/books?id=BOHYn7J4YzQC&printsec=frontcover. Fournet-Guérin, Catherine (2007) (フランス語). Vivre à Tananarive: géographie du changement dans la capitale malgache. Antananarivo, Madagascar: Karthala Editions. ISBN 978-2-84586-869-4. https://books.google.com/books?id=U_NHlyeI3mcC&printsec=frontcover. Fox, Leonard (1990). 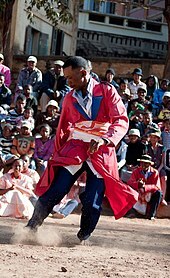 Hainteny: the traditional poetry of Madagascar. Lewisburg, PA: Bucknell University Press. ISBN 978-0-8387-5175-6. Freeman, Joseph John; Johns, David (1840). A narrative of the persecution of the Christians in Madagascar: with details of the escape of six Christian refugees now in England. London: J. Snow. https://books.google.com/books?id=rAMNAAAAIAAJ&printsec=frontcover. Frémigacci, Jean (1999). “Le Rova de Tananarive: Destruction d'un lieu saint ou constitution d'une référence identitaire?”. In Chrétien, Jean-Pierre (フランス語). Histoire d'Afrique. Paris: Editions Karthala. ISBN 978-2-86537-904-0. Gallieni, Joseph-Simon (1908) (フランス語). Neuf ans à Madagascar. Paris: Librairie Hachette. https://books.google.com/books?id=AL8RAAAAYAAJ&printsec=frontcover. Heale, Jay; Abdul Latif, Zawiah (2008). Cultures of the World: Madagascar. Tarrytown, NY: Marshall Cavendish. ISBN 978-0-7614-3036-0. https://books.google.com/books?id=PJWLCYGo2RgC&printsec=frontcover. Hillstrom, Kevin; Collier Hillstrom, Laurie (2003). Africa and the Middle East: a continental overview of environmental issues. Santa Barbara, CA: ABC-CLIO. ISBN 978-1-57607-688-0. https://books.google.com/books?id=XxIk9zTm_e8C&printsec=frontcover. Hobbes, Joseph; Dolan, Andrew (2008). World Regional Geography. Belmont, CA: Cengage Learning. ISBN 978-0-495-38950-7. https://books.google.com/books?id=yAgGHnENHjoC&printsec=frontcover. Hodder, Ian (1982). Symbolic and structural archaeology. New York: Cambridge University Press. ISBN 978-0-521-24406-0. https://books.google.com/books?id=dWdwiY7ziRYC&printsec=frontcover. Kennedy, David (2007). The Library of Congress World War II companion. New York: Simon and Schuster. ISBN 978-0-7432-5219-5. Kent, Raymond (1976). From Madagascar to the Malagasy Republic. Ann Arbor, MI: Greenwood Press. ISBN 978-0-8371-8421-0. Kitchen, Helen A. (1962). The Educated African: a Country-by-Country Survey of Educational Development in Africa. Washington, D.C.: Praeger. Kull, Christian (2004). Isle of Fire: The Political Ecology of Landscape Burning in Madagascar, Issue 246. Chicago: University of Chicago Press. ISBN 978-0-226-46141-0. Kusimba, Chapurukha; Odland, J. Claire; Bronson, Bennet (2004). Unwrapping the textile traditions of Madagascar. Textile Series. Los Angeles: Regents of the University of California. ISBN 0-930741-95-1. Lehoullier, Sara (2010). Madagascar: Travel Companion. New York: Other Places Publishing. ISBN 978-0-9822619-5-8. https://books.google.com/books?id=QhAbnvPKaVUC&printsec=frontcover. Middleton, Karen (1999). Ancestors, Power, and History in Madagascar. Los Angeles: Brill. ISBN 978-90-04-11289-6. https://books.google.com/books?id=My4B9q9FTiYC&printsec=frontcover. Moriarty, H.A. (1891). Islands in the southern Indian Ocean, westward of longitude 80 ̊east, including Madagascar. London: J. D. Potter. https://books.google.com/books?id=-NmhAAAAMAAJ&printsec=frontcover. Nalla, Mahesh (2010). Crime and Punishment Around the World: Volume 1, Africa. Los Angeles: ABC-CLIO. ISBN 978-0-313-35133-4. Ogot, Bethwell (1992). Africa from the Sixteenth to the Eighteenth Century. Paris: UNESCO. ISBN 978-92-3-101711-7. https://books.google.com/books?id=WAQbp7aLpZkC&printsec=frontcover. Oliver, Roland; Fage, John Donnelly; Sanderson, G.N. (1985). The Cambridge History of Africa. 6. Cambridge, U.K.: Cambridge University Press. ISBN 978-0-521-22803-9. https://books.google.com/books?id=xh-QcHRG3OwC&printsec=frontcover. Oliver, Samuel Pasfield (1886). Madagascar: an historical and descriptive account of the island and its former dependencies, Volume 1. London: Macmillan. https://books.google.com/books?id=lKtBAAAAIAAJ&printsec=frontcover. Pezzotta, Federico (2001). Madagascar: a mineral and gemstone paradise. Ann Arbor, MI: University of Michigan. ISBN 978-0-9715371-0-1. Pryor, Frederic L. (1990). The political economy of poverty, equity, and growth: Malawi and Madagascar. Washington, D.C.: World Bank. ISBN 978-0-19-520823-8. https://books.google.com/books?id=0P0fDzMA5lEC&printsec=frontcover. Rabearivelo, Jean-Joseph (2007) [1936 (translation by Robert Ziller)]. Translated from the Night. Pittsburgh, PA: Lascaux Editions. ISBN 978-1-60461-552-4. https://books.google.com/books?id=F-5I6QlMfJEC&printsec=frontcover. Rajaonarimanana, Narivelo (2001) (フランス語). Grammaire moderne de la langue malgache. Langues INALCO. Paris: Langues et mondes – l'Asiatheque. ISBN 2-911053-79-6. Ralibera, Daniel (1993) (フランス語). Madagascar et le christianisme. Paris: Editions Karthala. ISBN 978-92-9028-211-2. https://books.google.com/books?id=GOeAT76TGN0C&printsec=frontcover. Randier, Jean (2006) (フランス語). 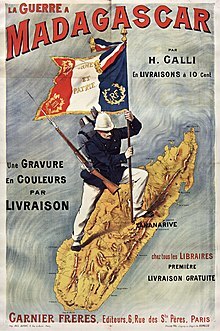 La Royale: L'histoire illustrée de la Marine nationale française. Maîtres du Vent – La Falaise: Babouji. ISBN 2-35261-022-2. Randrianary, Victor (2001) (フランス語). Madagascar: les chants d'une île. Paris: Actes Sud. ISBN 978-2-7427-3556-3. Ratsimbazafy, Ernest (2010-06-11). “Moraingy”. In Green, Thomas; Svinth, Joseph. Martial Arts of the World: An Encyclopedia of History and Innovation, Volume 2. Santa Barbara, CA: ABC CLIO. ISBN 978-1-59884-243-2. https://books.google.com/books?id=P-Nv_LUi6KgC&printsec=frontcover. Regnier, Denis (2015). “Clean people, unclean people: the essentialisation of 'slaves' among the southern Betsileo of Madagascar”. Social Anthropology 23 (2): 152–158. http://onlinelibrary.wiley.com/doi/10.1111/1469-8676.12107/abstract. Reinsch, Paul Samuel (1905). Colonial Administration. New York: Macmillan. https://books.google.com/books?id=bfsmAAAAMAAJ&printsec=frontcover. Rodd, Tony; Stackhouse, Jennifer (2008). Trees: A Visual Guide. Los Angeles: University of California Press. ISBN 978-0-520-25650-7. https://books.google.com/?id=Mpsc2hsYk1YC&printsec=frontcover. Room, Adrian (2006). Placenames of the world: origins and meanings of the names for 6,600 countries, cities, territories, natural features, and historic sites. Jefferson, NC: McFarland. ISBN 978-0-7864-2248-7. https://books.google.com/books?id=M1JIPAN-eJ4C&printsec=frontcover. Sharp, Leslie (2002). The Sacrificed Generation: Youth, History, and the Colonized Mind in Madagascar. Berkeley, CA: University of California Press. ISBN 978-0-520-22951-8. https://books.google.com/books?id=5IFbKsKxYQYC&printsec=frontcover. Shillington, Kevin (2005). Encyclopedia of African history. New York: CRC Press. ISBN 1-57958-453-5. Strakes, Jason (2006). “Encyclopedia of the developing world”. In Leonard, Thomas M.. Encyclopedia of the developing world. 1. New York: Taylor & Francis. ISBN 978-1-57958-388-0. https://books.google.com/books?id=3mE04D9PMpAC&printsec=frontcover. Thompson, Virginia; Adloff, Richard (1965). The Malagasy Republic: Madagascar today. San Francisco, CA: Stanford University Press. ISBN 978-0-8047-0279-9. Uwechue, Raph (1981). Makers of modern Africa: profiles in history, Volume 1. Dearborne, MI: Africa Books Ltd. ISBN 978-0-903274-14-2. Van Den Boogaerde, Pierre (2008). Shipwrecks of Madagascar. New York: AEG Publishing Group. ISBN 978-1-60693-494-4. https://books.google.com/?id=I_S1D8cnTiEC&pg=PT19. Wink, André (2004). Volume 3 of Al-Hind: The Making of the Indo-Islamic World: Indo-Islamic society, 14th–15th centuries. Leiden, The Netherlands: Brill. ISBN 978-90-04-13561-1. https://books.google.com/books?id=nyYslywJUE8C&printsec=frontcover.